I saw this picture today while I was at work and I loved it! Sometimes you have to BELIEVE you can make a difference. Sometimes we say, “it would be nice if this or that would happen or change”…but we don’t really, truly believe we can do anything to bring about that change. If you go into something not believing you can change it or make a difference…you won’t, or you will burn out really fast. People that have caused change, that have made a difference believed they could–and then they took action! If you want to make a difference somewhere…believe you can…then come up with a plan…and then get to work and make it happen! 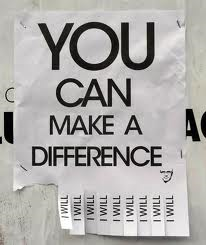 MAKE A DIFFERENCE IN YOUR WORLD! « Coffee House Insider, New Oxford Coffee Co.
That’s awesome! I totally agree with you. That belief is so important. If you don’t have it, your subconscious mind won’t let you waste energy on something you don’t believe is possible.